Samson's MXS3000 Professional Power Amplifier is designed to deliver premium power in any sound reinforcement application that requires exceptional sound and high wattage support. Astonishingly efficient, the MXS3000 combines easy operation, comprehensive protection and impressive output levels into a small, lightweight design perfect for any live performance or installation setup. With a dual rack space, Class H design, the MXS3000 produces 1,550 watts of stereo power at 4 ohms and 4,600 watts of bridged mono power at 4 ohms. The power amp employs an intelligent switch mode power supply design that provides optimal power distribution and maximum efficiency by continuously monitoring the signal level. This smart distribution eliminates excess heat or wasted energy. The MXS3000 also features low noise fans to ensure its high-grade power transformer has continuous access to cool air. The MXS3000 sports a sleek, user-friendly front-end design with detented level controls for each channel, as well as Signal, 10dB and Peak level LEDs for optimal use on dark stages. It offers additional LEDs to indicate your current operating mode and filter settings. The MXS3000 offers XLR and 1/4" inputs, as well as Binding Post and Speakon outputs. In addition, the power amp's 3-position Mode selector switch allows for easy toggling between Mono, Stereo and Bridged Mono modes. The MXS3000 also has a 3-position Filter (120Hz, Full, 28Hz) filter selector switch for optimizing the power amps to your specific setup demands. 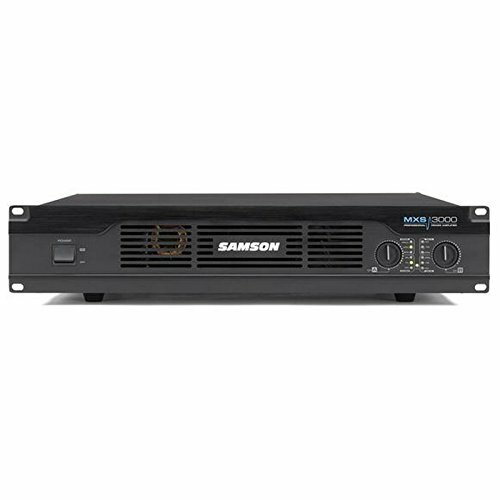 Designed to support efficient and safe performance, Samson's high-powered MXS3000 offers pro-level power solutions for live music venues, houses of worship and health clubs, as well as for mobile DJs, outdoor parties and touring musicians.